Website posts are in chronological order. To find a specific post faster, please use the search function located above. Later today, flurries are expected. 2 cm of snow may fall, but the asphalt temperature is already well above zero - meaning that it should melt shortly after falling. City staff are ready to address any weather conditions we may get – with salt trucks and plows where needed. We do not anticipate the temperatures to drop below zero, but if they do, residents may see plows out with the blades lifted. This is not because they are driving around without work, but rather that they are spot salting – treating icy areas to ensure road safety. Salt trucks serve a dual purpose in that they both plow and salt. Later this evening, the conditions will change again, and we expect to see temperatures rise into the double digits this weekend, as well as an accumulation of 5-10 mm of rain. Until the predicted snow arrives, city teams will be out in full-force to address potholes. We have full complements of teams out applying temporary patches to the worst holes in our roadways. Teams will continue throughout the weekend, however, when rain falls, and the holes fill with water, the work is less effective. In wet conditions, crews are only sent out to fill emergency potholes. As soon as the conditions dry, teams will be back out to continue filling the potholes. Since January 1, 2019, Roads staff have filled 91,494 potholes. Street sweeping has begun in some areas of the City where conditions allow. Sweeping is not done in areas where ice pack still exists. There are also limitations if there is snow still piled beside sidewalks or roadways. To try and sweep in those areas now would not produce quality results and crews would have to return again when the snow and ice melted to collect the grit and sand embedded within it. Instead, some areas will see sweepers out this weekend tackling sidewalks. Some of the sidewalk machines have been fitted with giant brooms which push the grit and debris to the side of the roadway where the street sweeping machines will come by and vacuum it up. Over the weekend, this sweeping of sidewalks and boulevards (the area between a sidewalk and roadway) in limited areas will be undertaken with hopes that we can begin operations in full force next week. The City owns nine vacuum sweepers. They will be deployed today, and over the weekend – as weather permits, to tackle problem areas. Residents can support the street sweeping process by keeping the sidewalks in front of their homes clear from garbage and recycle bins. Also, if you see a street sweeper coming down your street, please consider parking your car elsewhere so the sweeper can get as close to the curb as possible. This allows for a more efficient and thorough cleaning. Drainage and flood monitoring and mitigation is underway and is a top priority. As part of their weekend responsibilities, staff will be out all weekend monitoring conditions and known problem areas to proactively address concerns. Roads staff work closely with their partners in the Emergency Management Team to respond to flooding concerns. The current weather conditions have been perfect for mitigating flood concerns in the region. Warmer daytime temperatures allow for moderate melting during the day. Cool temperatures in the evenings and overnight mean the flow is slowed. We have not seen significant water issues at this time. I have been working closely with OC Transpo concerning transit service issues raised by residents in order to address safety concerns, route reliability, and more. Included in the 2019 Budget for OC Transpo is a bus service expansion investment of $5M and the purchase of new buses to provide expanded service. 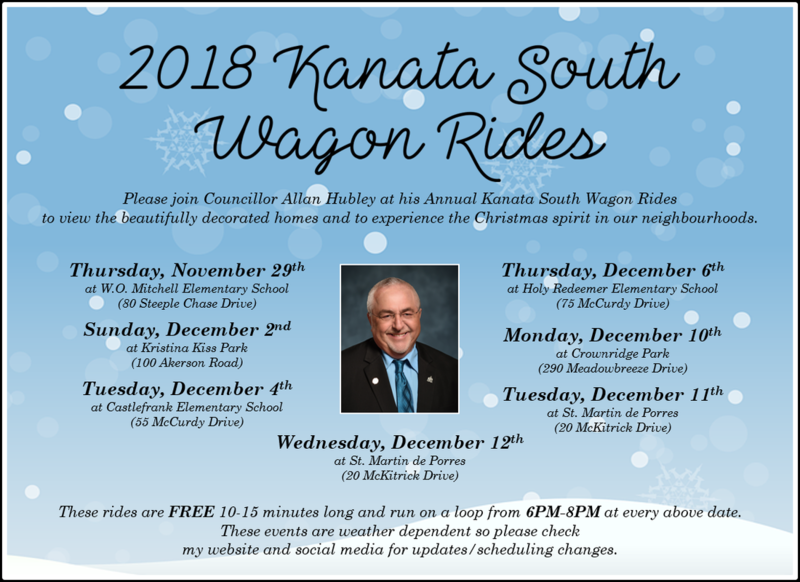 A number of route changes are being proposed for Kanata South (please also find a map illustrating these changes below), and I encourage residents to email me at allan.hubley@ottawa.ca with their feedback on the below proposals. Staff have been closely monitoring the capacity on the Route 256, and reviewed our request to create a new separate Connexion route to serve the eastern part of Bells Corners instead of the Route 256. Staff recommend that a new Route 251 be introduced between Bells Corners and Tunney’s Pasture Station, and that Route 256 be revised to operate via Moodie Drive. This would relieve current ridership pressure on Route 256, and would also allow a new connection from Route 256 to Routes 63, 64, and 66 at Moodie Station for customers destined for the DND offices on Moodie and for workplaces in Kanata North. Staff have reviewed our request to address the safety concerns brought to my attention from residents trying to catch their bus on the south side of Hope Side Road. Once Hope Side Road undergoes a full rehabilitation as part of the Kanata South Link project for which Phase 1 has just begun, safe and accessible bus stops will be constructed. To address these safety concerns in the meantime, Staff have developed an option to revise Routes 252 and 164 to operate on Meadowbreeze, Summergaze, and Summitview to remove the need for customers to cross Hope Side Road. Route 269 to be renumbered at the request of family of a victim of the fatal bus crash at Westboro Station. Route 256 would be revised to operate directly along Bridgestone between Stonehaven and Grassy Plains. Route 257 (formerly Route 269) would be revised to start at Bridle Park and Stonemeadow, operating along Stonemeadow and Stonehaven to Pine Hill before continuing its current route. 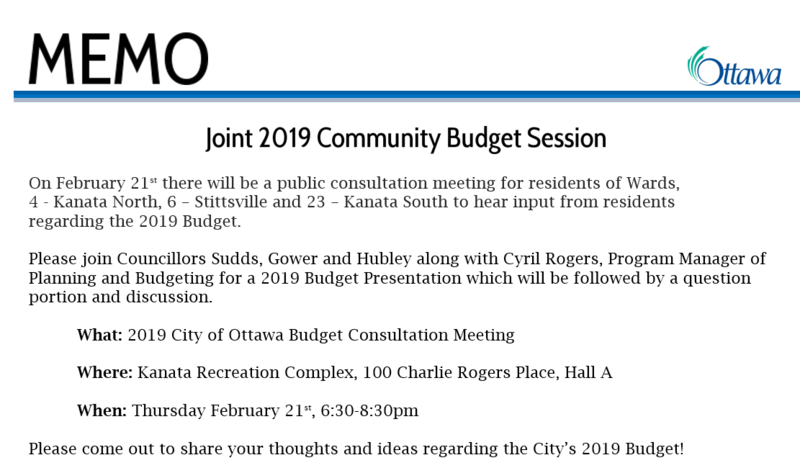 PLEASE TAKE NOTICE that the City of Ottawa will hold a Public Meeting on Thursday March 28th, 2019 from 6:00 PM - 8:00 PM in the Kanata Recreation Complex, Program Room (100 Charlie Rogers Place) to discuss a proposed plan of subdivision. A location map showing the location of the land proposed to subdivided is attached. The Owners, Claridge Homes, are proposing to develop 409 residential units including 34 semidetached units, 255 street-oriented townhouses, 120 back-to-back townhouses, as well as two parks (a 1.03 hectare park will be added to the Proudmore Romina Park expanding its existing size; and a 0.40 hecatre parkette is proposed in the southern portion of the development.. The City’s Pathway Patrol program has been around since 1997 and has helped make Ottawa’s pathways safer. Safer Roads Ottawa is looking for volunteers who love our city and want to become ambassadors of our pathways by joining the growing Pathway Patrol team. Our season runs from May to October. Whether you walk, run, roll or cycle, they would love to have you involved. If you answered YES, then consider becoming part of our Pathway Patrol Team! Requirements include a recent Police Records Check, First Aid Training (provided) and a commitment of 6 hours per month. Contact pathwaypatrol@ottawa.ca or 613-580-2424, extension 28064 to find out more about this great program! Ottawa – There will be no curbside green bin, recycling or garbage collection on Wednesday, February 13. The Wednesday pick-up will take place on Thursday, February 14. In addition, the collection will be delayed by one day for the remainder of the week. Multi-residential garbage, recycling and green bin collection is also delayed by one day for the remainder of the week. ​Plows have been out all night clearing the main arterials of the 27 cm of snow that has fallen so far. Plowing of local residential streets will commence this morning and as this will be a slow process, the Roads Dept. are asking residents to exercise patience as they get through residential communities. The overnight parking ban will remain in effect under the provisions of By-Law 2017-301 as Roads crews plow streets and attempt to widen them for vehicle circulation. If you have a vehicle parked on the road, please move it so the plows can get by. Thank you for your patience and understanding. Please see the below note I have received from the Director of Roads Services regarding the storm that is due to start later today. Thank you so much for your patience and understanding while our hard working Roads Team prepares for this major snow event and throughout their efforts to clean up! ​Thank you to everyone who has contacted my office regarding the issues of on street parking and your feedback provided in these posts. I am aware of the issues faced in newer communities within Kanata South and on narrower streets in some of our older communities. I have been working with the Roads Supervisor as well as By Law Services the past few weeks to address the most current examples. The main problem identified by residents is that people are leaving their vehicles parked on the roadway during and after a snowfall. As you are aware, when the plows go by parked vehicles, this leaves a large amount of snow left on the streets which can harden into ice leaving the roadway uneven. When people choose to leave cars on both sides of the street, not only is it a challenge for the plow to pass but also poses problems for garbage trucks, school buses and most importantly emergency vehicles. To ensure emergency vehicles and snow plows can get down your street, please make certain to not park your vehicle on the roadway. If you have a neighbour who leaves cars on the road, please help get this message to them so they don’t get ticketed. We have received a record amount of snow so far this month with more coming tonight into Tuesday. Please park your vehicles in your driveways so that the plows can get by to clean the roadways. It is important to keep cars off the streets from the start of the snow and for 24 hours after so snow clearing operations can be completed. With current levels of snow, snow removal has begun, however, snow banks are removed first on streets where no cars are parked. By Law Services was out last week after the storm and ticketed 103 vehicles for parking on the roadway during the overnight ban. As a result of the high number of residents not respecting the overnight ban, Bylaw has added many areas of Kanata South to their “hot list” and will be by again to ticket should the overnight parking ban be enacted or when residents call 311 because they feel their roadway has become an unsafe situation. With regards to the removal of on street parking, I have been working with city staff over the past 2 winters on a pilot project where winter parking problems have been identified and we have removed parking on one side for a number of streets within Kanata South. I suggest locations that are brought to my attention be assessed by the Traffic Safety Dept. for seasonal parking restrictions, however, the final decision is up to the discretion of the Traffic Dept. In order to have parking restrictions applied year round or outside of the seasonal parking restriction pilot project, there is a formal petition process that is available to residents, which has been successful on a number of streets in our Kanata South communities. The Traffic Department can review the roadway and work with the resident who is inquiring to draft proposed changes that are desired. The formal petition, obtained from the Traffic Department, must be circulated by a resident with an address on the street that is to be petitioned. The person circulating the petition must obtain 66% concurrence in the form of signatures. This ensures that any residents who would be impacted by changes to on-street parking are able to participate in the decision process and to prevent someone who uses your street but does not live on it from making changes to it without your knowledge. The 66% rule recognizes not everyone will agree but it is the desire of the clear majority. Upon successful completion of the petition, they will review and request consent from the Ward Councillor. ​Residents of Kanata will have an opportunity to sign the Book of Condolences to honour victims of the Westboro Station bus collision and convey their sympathies to neighbours and commuters on route 269. The Book of Condolences will be available at Eva James Memorial Community Centre starting at noon, Monday, January 21, where it will remain until end of day Sunday, January 27. An online version of the Book of Condolences is also available on ottawa.ca until end of day Sunday, January 27. ​Thank you to OC Transpo and Ottawa Public Health staff who were along the Transitway and at the Park & Rides this morning to assist riders during this difficult and emotional time. Our entire city has been affected by this tragic accident, and the outpouring of support I have seen offered from our community to those affected is overwhelming. Our thoughts are with the injured, who are enduring the unimaginable physical trauma and emotional toll. Our thoughts are with the families, friends, and loved ones of the victims - Bruce Thomlinson, Judy Booth, and Anja Van Beek – who are experiencing indescribable grief and loss. December 14, 2018 – The City of Ottawa would like to remind residents of the following schedule changes for the holiday season, from Monday, December 24, 2018 to Wednesday, January 2, 2019. Ottawa City Hall and all seven client service centres, including the Government Service Centre located at 110 Laurier Avenue West, will be closed on December 25, December 26 and January 1. The City’s Provincial Offences Court, including the courts located at 100 Constellation Crescent, will be closed on December 25, December 26 and January 1. Rural client service centres (Metcalfe, West Carleton and North Gower) will operate on a reduced schedule, from 8:30 am to noon from Tuesday, December 18 to Thursday, December 20. They will be closed from Tuesday, December 25 to Thursday, January 3. The centres normally operate three days a week and regular business will resume on Tuesday, January 8. There will be no curbside or multi-residential green bin, recycling, garbage or bulky item collection on Christmas Day. Christmas Day’s pickup will take place on Boxing Day and all collection will be delayed by one day for the remainder of the week. New Year’s Day pick-up will take place on Wednesday, January 2 and all collection will be delayed by one day for the remainder of the week. The Trail Road waste facility will be closed on Christmas Day and New Year’s Day. Christmas trees will be picked up on your regular garbage day. Please remove all decorations. Christmas trees in plastic bags will not be collected. Free parking will be available at City Hall, 110 Laurier Avenue West, from Monday, December 24 at 6 pm to Thursday, December 27 at 6 am, and from Monday, December 31 at 6 pm to Wednesday, January 2 at 6 am. The ByWard Market Garage at 70 Clarence Street and the Dalhousie Garage at 141 Clarence Street will offer free parking from Monday, December 24 at 5 pm to Wednesday, December 26 at 7 am, and from Monday, December 31 at 5 pm to Wednesday, January 2 at 7 am. All other City of Ottawa parking regulations and restrictions will apply. OC Transpo will operate on a reduced schedule from December 24 through December 28 and from December 31 through January 4. Timetables are available at octranspo.com and octranspo.mobi. Call 613-560-1000 or text 560560 plus your four-digit bus stop number for real-time schedule information. For more information, holiday schedules and travel planning, call 613-741-4390 or visit octranspo.com. A family or group can travel all day for the cost of one DayPass with the Family DayPass, which can be purchased for $10.50 from the bus operator when boarding, or from a ticket machine at any O-Train Line 2 station. A family or group can include up to six people, with a maximum of two people aged 13 or older. OC Transpo and Para Transpo will offer free service after 8 am on New Year’s Eve. The Rideau Centre OC Transpo Customer Service Centre will be closed on Christmas Day and New Year’s Day. It will be open on Boxing Day from 8 am to 8 pm. Customer Service Centres at the Lincoln Fields, Place d’Orléans and St-Laurent Stations will be closed on Christmas Day, Boxing Day, and New Year’s Day. STO users can plan their trip using Plani-bus. School trips will not operate from Monday, December 24 to Friday, January 4. Customers are reminded to suspend any other regular bookings if they will be on vacation during the holiday season. Para Transpo’s taxi coupon booking line (613-842-3670) will be closed on Christmas Day, Boxing Day, and New Year’s Day. The line for reservations and cancellations (613-244-7272) will be open regular hours. OC Transpo Customer Relations (613-842-3600) will be closed on Christmas Day, Boxing Day, and New Year’s Day. Pools, arenas and fitness centres will be operating on modified schedules during the holiday season, including public swimming, fitness and public skating facilities. Please check ottawa.ca for schedules. Most registered programs at community centres, arenas and swimming pools will be cancelled. Clients should check with their facility to confirm, as some exceptions will apply. Holiday schedules for outdoor rinks, such as the Sens Rink of Dreams, Lansdowne Park skating court, Ben Franklin Place skating rink and Jim Tubman Chevrolet Sens Rink can be found at ottawa.ca/skating. Check the alert status on the homepage of ottawa.ca to confirm that the rink is open. The Sexual Health Clinic and satellite clinics will be closed on Boxing Day and New Year’s Day. Christmas Eve, closed. Please visit 179 Clarence Street or call the Somerset West Community Health Centre NESI van (613-761-0003) for mobile harm-reduction services. Please refer to Ottawa Public Health’s website for hours of operation for the Parenting in Ottawa Drop-ins. The Dental Clinics will be closed on Christmas Day, Boxing Day and New Year’s Day. The Ottawa Public Health Information Centre will be closed on Christmas Day, Boxing Day and New Year’s Day. Staff will respond to phone messages and inquiries within one business day. Find the latest health information at OttawaPublicHealth.ca. The Karsh-Masson Gallery, City Hall Art Gallery and Barbara Ann Scott Gallery at City Hall will operate on a regular schedule throughout the holidays. All other City of Ottawa arts centres, galleries, theatres and museums will be closed. Clients should check ottawa.ca or their facility to confirm, as some exceptions may apply. The City of Ottawa Archives Reference Services and Gallery 112 will be closed from Sunday, December 23 and will reopen on Wednesday, January 2. All Municipal child-care centres will be closed on Christmas Day, Boxing Day and New Year’s Day. Parents are advised to check operating hours with their childcare centres during the holiday season. All branches and services of the Ottawa Public Library will be closed on Christmas Day, Boxing Day and New Year’s Day. Branches and services will operate normally from December 27 through December 30. On Christmas Eve and New Year’s Eve, branches that normally close at 5 pm will close early, at 3 pm. Branches that normally close before 3 pm will maintain regular hours. Visit the OPL website for further information and to access library services online. I would like to provide you with an update regarding the request for a traffic light at the Fernbank/Romina intersection. As previously mentioned, I have been asking the Traffic Dept. to monitor this intersection for quite some time and unfortunately, it has never met the Provincial warrants needed to justify the installation of an all way stop control. The latest review that was conduced this past summer at the Fernbank/Romina intersection indicated that 100% of the warrants needed to justify a signalized crossing have been met. The addition of a traffic light has been approved and the Transportation Planning Department will be adding the need for traffic lights at this location in their 2019 plans. I will provide updates here and on my website as they are available.